2017. Entigar, K. The limits of pedagogy: diaculturalist pedagogy as paradigm shift in the education of adult immigrants. Pedagogy, Culture & Society, 25(3), 347-356. 2017. Entigar, K. “Low-Status” Adult Immigrants and Non-Profit Education: Paternalism, Participation and New Pedagogical Possibilities. Kappa Delta Pi Record. 2016. Michelli, N., Jacobowitz, T., Entigar, K., Waller, M. How Current Education Policies are Challenging the Mission of the NNER: A Call to Action. Education in a Democracy: A journal of the NNER. Seattle, WA: National Network for Educational Renewal. 2016. Entigar, K. Translanguaging with Multilingual Students: Learning from Classroom Moments by O. García & T. Kleyn. 2017. Provost’s Pre-Dissertation Research Fellowship, The Graduate Center of the City University of New York. $4,000 for the development and execution of preliminary research during Summer 2017. 2016-2017. Doctoral Student Research Grant, The Graduate Center of the City University of New York. $1,250 to support conference attendance. 2014-2019. Graduate Center Fellowship, The Graduate Center of the City University of New York. $55,000/year for five years. 2013. The Book Award for Academic Excellence in Applied Linguistics, University of Massachusetts Boston. 2013. Golden Key International Honors Society, University of Massachusetts Boston. 2012-2013. UMass Boston Teaching Language with Technology Title III Scholarship (3 semesters). 2017. Roundtable Discussions: Social Justice and Democracy in Education. Manhattan College, Bronx, NY. April 25. 2016. Re-Humanizing Non-Profit Adult Education: Challenging Paternalism in Transition-Minded Pedagogy and Envisioning Theoretical and Programmatic Alternatives. Eastern Sociological Society 86th Annual Meeting, Boston, MA, March 17-20. 2016. Understanding and Influencing Education Policy. New York Collective of Radical Educators Annual Conference, New York, NY, March 19. 2015. Education Policy and the Agenda for Education in a Democracy. How Can the NNER and the Settings Respond to a Policy Crisis? Paper Session presented at the annual National Network for Education Renewal Conference, Chico, CA, October 1-3. 2017. Agency, Subjectivity and Collaboration toward a Transformative Pedagogy in Education with Adult Immigrant Learners in Nonprofit Organizations. The Early Research Initiative, The Graduate Center of the City University of New York, New York, NY, September 1. 2016. The reification of English in the non-profit education of adult immigrant learners. Over the Wall/Saltar el Muro: Compromiso público y academia/Public Engagement & Academia. Hispanic and Luso-Brazilian Literatures & Languages 22nd Annual Graduate Student Conference, The Graduate Center of the City University of New York, New York, NY, April 27-28th. 2016. The reification of English in the non-profit education of “low-status” adult immigrant learners. Multilingualism and Language Empowerment: A Response to Inequality, The Graduate Center, City University of New York, September 23. 2016. “Low-status” adult immigrant learners in non-profit education: framing failure as a first step in pedagogy and academia. Interdisciplinary Graduate Theory Workshop: Failure, New York, NY, April 8. 2016. 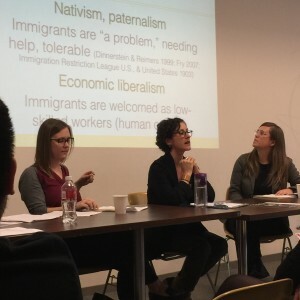 The limits of pedagogy: diaculturalist pedagogy as paradigm shift in the education of adult immigrants. Hispanic and Luso-Brazilian Literatures & Languages 20th Annual Graduate Student Conference, The Graduate Center of the City University of New York, New York, NY, April 24-25. Pilot Study, The Graduate Center of the City University of New York. Research location: Catholic Charities, New York, NY. Conducted research for mixed-methods pilot study with and for adult immigrant student-participants in nonprofit education organizations in lower Manhattan funded by Provost’s Pre-Dissertation Summer Research Award. Award amount: $4,000. CUNY–New York State Initiative on Emergent Bilinguals (CUNY-NYSIEB), New York, NY. Principal Investigators: Ricardo Otheguy, Ofelia Garcia. Conducted research for CUNY–New York State Initiative on Emergent Bilinguals (CUNY-NYSIEB), a New York State Education Department initiative, on three sub-populations of emergent bilinguals in the U.S. public school system in order to create a summary and a set of proposed recommendations to the NYC Department of Education. Grant amount: $4,500. Conducted gap analysis/literature review and provided recommendations based on best practices in non-traditional/continuing education programs at higher education level. 2012-2013. Curriculum Developer and Research Assistant. University of Massachusetts Boston, Boston, MA. Helped develop courses for Rethinking Equity of Teaching English Language Learners (RETELL) and the Massachusetts Licensure Academy (MLA), in collaboration with the Department of Elementary and Secondary Education (DESE) and the University of Massachusetts Boston. 2017. Volunteer teaching (English as a Second Language) with Catholic Charities, New York, NY.